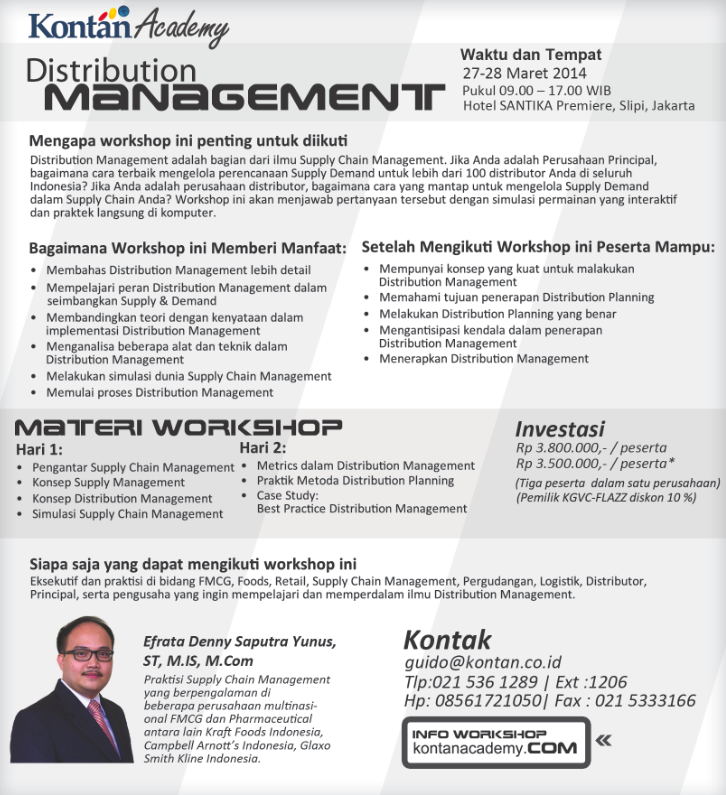 Distribution Management Workshop in Jakarta 25-26 Juni 2015. This workshop will held in Hotel Santika Premier Slipi Jakarta. 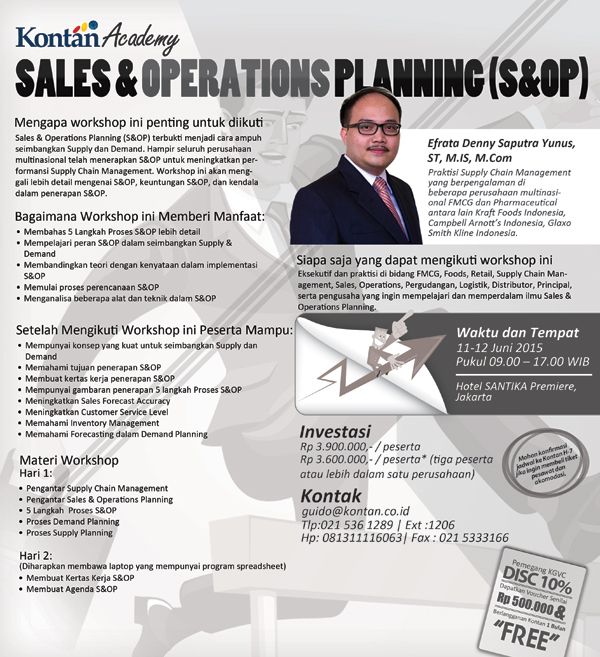 Sales and Operations Planning Workshop. This workshop will held in Santika Premier Hotel Slipi Jakarta 11-12 June 2015. If you interested in learning more about Sales and Operations Planning and want to boost your career in Supply Chain Management, this workshop will be useful for you. 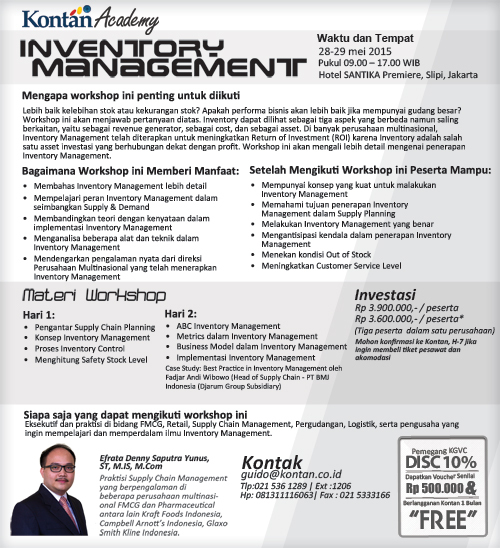 Inventory Management Workshop 28-29 May 2015 in Santika Premiere Hotel Slipi Jakarta. You can learn all about Inventory Management in this two days workshop. I will hold a workshop on Global Logistics and Supply Chain. This workshop will be held on Thursday and Friday on 23 to 24 April 2015 at the Hotel Santika Premier Slipi Jakarta. 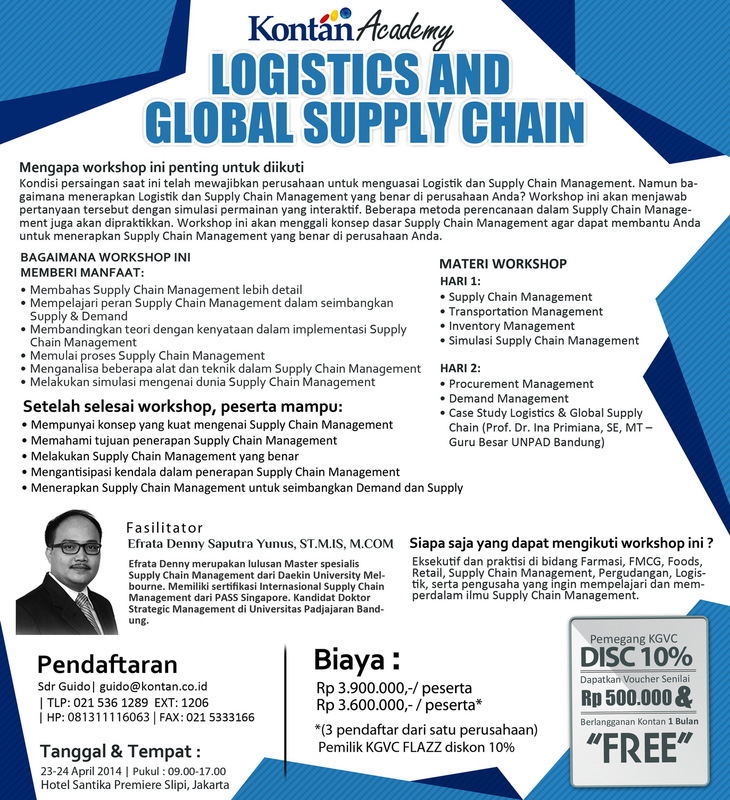 If you are interested in the topic of Supply Chain Management, it would be nice if you attending this workshop. Guest speaker in this workshop is Prof. Dr Ina Primiana, SE, MT (Professor of Operations Management at the University of Padjadjaran Bandung) that will bring the most cutting-edge case studies on Supply Chain Management. 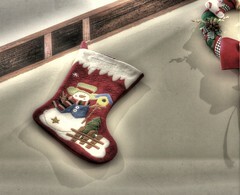 I will facilitate another workshop in Operations Management. 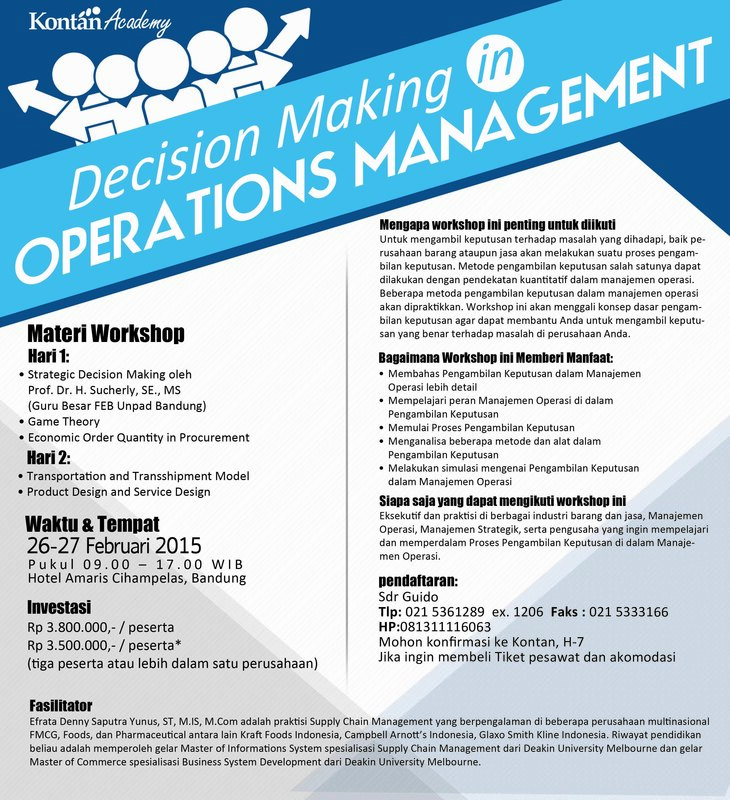 The next topic is Decision Making in Operations Management. 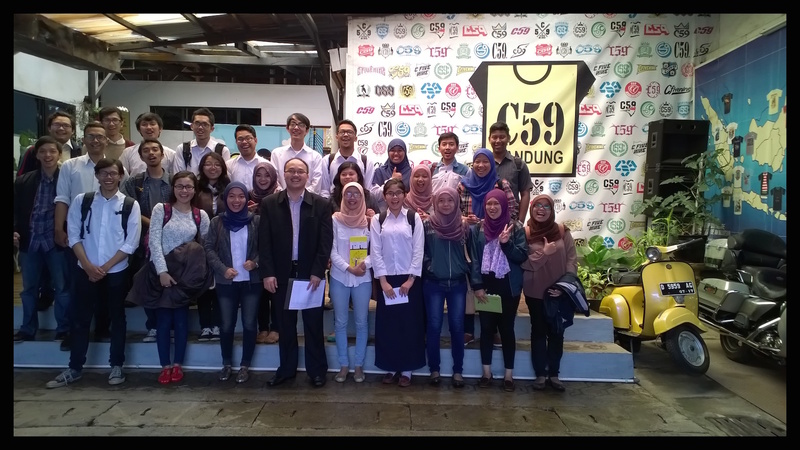 This workshop will also invite Professor Sucherly from Padjadjaran University as a guest speaker. 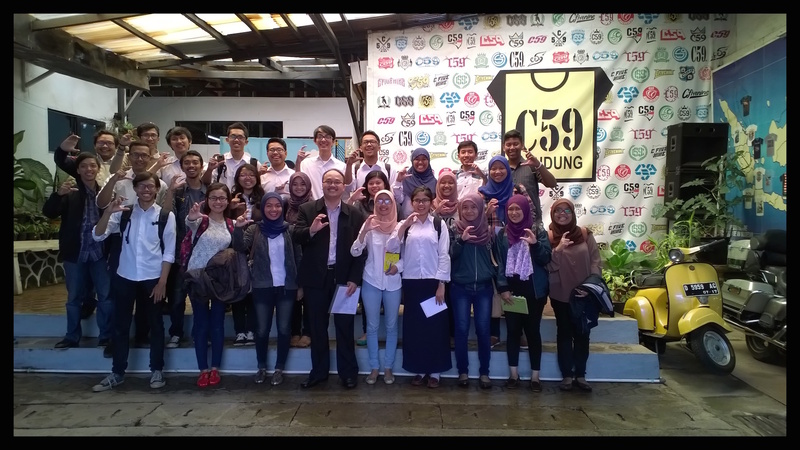 He will share about Strategic Decision Making. For you who are interesting to join, you can read the details in below brochure. 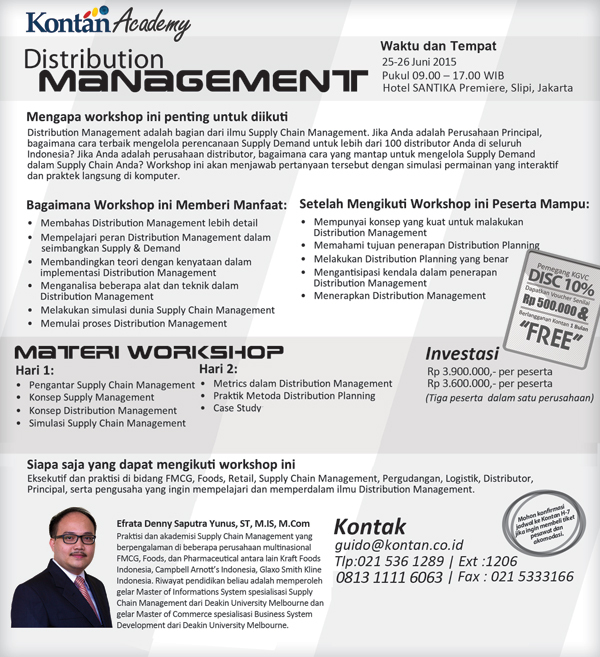 I will become a facilitator in Distribution Management Workshop by the kontanacademy.com. This workshop will be held in Santika Premier Hotel, Jakarta on 27-28 March 2014. 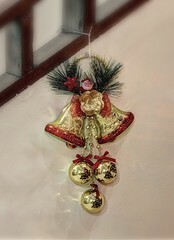 Entrance fee is only USD 380. Grab your seat now 🙂 For you who want to know more about Distribution Management, this workshop is recommended.